Soul Traveler: What kind of animals live in South Africa? Southern Africa is very fortunate to have the largest variety of animals in the world. It is home to more than 800 bird species, 229 mammal species, about 400 reptiles & thousands of invertebrate animals like insects and arachnids. There are more than 400 species of reptiles and about 130 snake species occurring in Southern Africa. Interesting reptiles to look out for are the tortoise, crocodile, chameleon and numerous lizard species and the african rock python. Although there are many snakes only 1 tenth are poisonous, they are highly sensitive and keep out of humans way. South Africa ranks as one of the best birding areas in the world and is home to over 850 species of which around 50 are endemic to South Africa. (found only in SA). 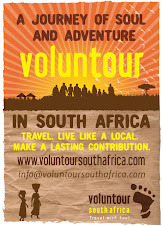 The list is long and it would be wise to check out this site www.sabirding.co.za. The most well known are, african penguin, knysna loerie, blue crane, lilic breasted roller, cape vulture and the jackal buzzard. Insects are the most abundant animal species on earth. There are more than a million insect species on earth and more than 100 000 can be found in South Africa. The praying mantis is one to look out for as it is a symbol of good luck.The Baboon spider, a common resident, is a ground dwelling hairy spider and is considered one of the largest spiders in the world. It ranges in size from 2 to 6 cm in body length, but is not poisonous. The marine life abundant along the South Africa coast line and at certain times of the year you can see the humpback and southern right whales come close to shore to calve. Besides the dolphins, jelly fish, leather back turtles and other colorful sea creatures the one worth mentioning is the infamous great white shark, this is a highly underrated animal which is worthy of our respect rather than fear. South Africa's marine and wildlife is continually under threat from the ever expanding human race, the creatures are fast loosing their habitat and food source. We as individuals have a responsibility to be the voice of these creatures to honor them and ensure their continued survival. It is thanks to the ever-increasing presence of wildlife sanctuaries, animal welfare groups and concerned members of the public that the animals have a rightful chance on this earth. A quick tip: if you are a fish eater, then sms the name of the fish you are about to eat to 0794998795 BEFORE you order it, you will be sent an sms reply telling you if that species is endangered or not.